As Reuters ably showed yesterday, Venezuela’s wave of demonstrations and crackdowns are unlikely to affect the oil industry “in the short term.” The article left out the long term, but it’s pretty clear that it these rallies and counter-rallies can’t help the industry get out of its long-term slump. 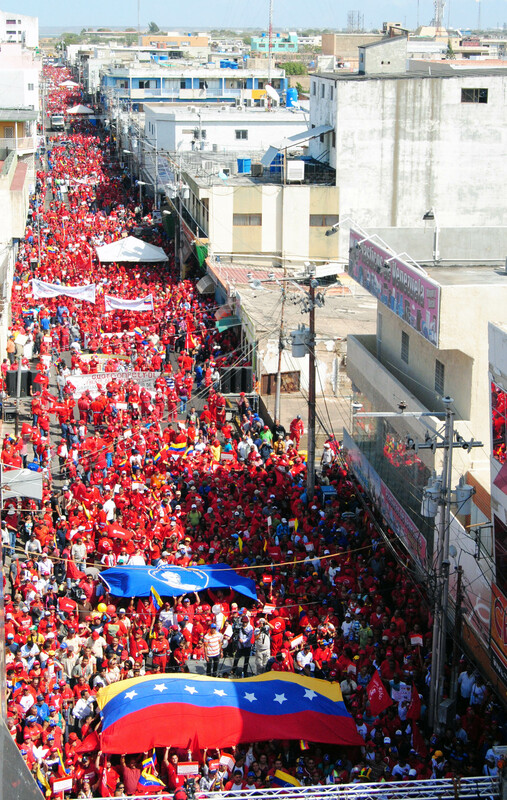 Every day that goes by like workers marching instead of, you know, working, and every time the oil minister has to spend hours either speaking about politics or attending cabinet meetings is another day of delay for PDVSA’s big capital projects: building new cities, ports, water systems and pipelines in the Orinoco belt, arranging financing with private partners, that sort of thing. For those of us worried about global climate change, these delays are a good thing — they keep some of the world’s dirtiest crude in the ground, raising fuel prices and encouraging a transition to clean energy. For those of us worried about the well-being of the Venezuelan people, the news isn’t so happy. Remember this chart, showing in schematic form how the government’s oil output goals have grown more ambitious over the years. When I wrote that, four months ago, Venezuela was aiming for roughly a 3 million barrel-a-day increase over the following five years. Of course output changes in big increments, but that works out to about 2,000 barrels a day of new production in order to overcome decline and also boost output. Every single day that workers are out enjoying the sunshine means those 2,000 barrels need to be spread out among the remaining days. 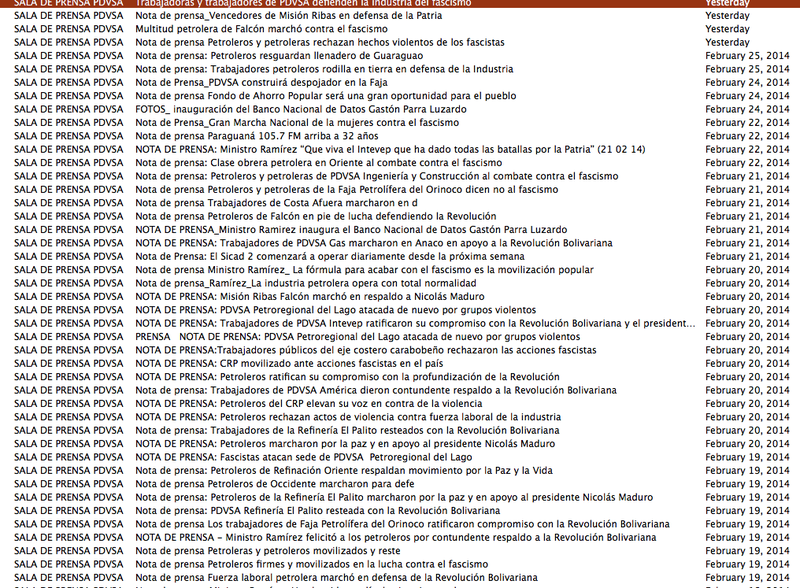 Since Feb. 16, the company has sent 53 press releases, of which one was specifically about oil operations (PDVSA to construct blending plant in Orinoco Belt), and one more about PDVSA bonds. In other words, the real cause of these protests — that Venezuela is falling into an economic shithole — has no near-term exit. UPDATE: I just want to point out that this post is an example of the kind of lazy reporting I like to complain about. What happens on the internet (or in this case e-mail) doesn’t actually matter. What matters happens in the hands and heads of the Venezuelan people. And I’m not there, so I can’t report much on that, so I write what I know, which isn’t much. For better info, find people on the ground, especially people whose politics you disagree with, follow their tweeters, read what they are seeing and saying. This entry was posted in Uncategorized and tagged oil, pdvsa, venezuela on February 27, 2014 by Steven Bodzin. This entry was posted in Uncategorized and tagged reputation management on February 10, 2014 by Steven Bodzin.